York & District Trades Union Council Campaigns,Events A COACH FULL! PLEASE NOTE THE LAST FEW SEATS ON THE COACH TO LONDON HAVE BEEN FILLED AND ALL ATTENDEES SHOULD HAVE RECEIVED THEIR TICKETS BY EMAIL. SEE YOU ON THE COACH! 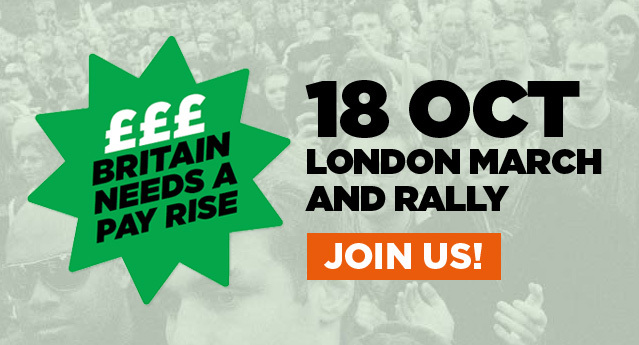 We are joining the TUC’s march on Westminster and rally in Hyde Park. Coaches leave York at 6am and Castleford at 7am. If you are a Unison member you get an £8 contribution from Unison, if you are a Unite member you get the whole ticket courtesy of Unite and if you are a member of another union, ask your branch if they will fund your ticket!